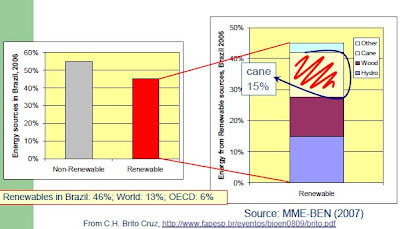 Latin America produces bioenergy in ways that meet sustainability criteria much better than most if not all presently available alternatives. The region has potential to expand bioenergy generation without compromising food production, the environment and biodiversity. The realization of this potential will require determination and diligence in knowledge creation, its application, and regulation. Latin America stands ready to work with the global community to understand and further improve bioenergy systems and to expand the application of such systems in ways that address pressing human needs. Latin America has proved its potential to fulfill an important role in providing biofuel for local as well as world demand. Biofuel production started as an energy security matter and progressed into a sustainable and profitable industry. Latin America regards the issue as an opportunity for economic and social development based on three pillars: people, planet and profit. Local feedstock diversity exists and presently sugarcane is perceived as a major feedstock for sustainable ethanol production. Land resources are available without compromising food security and ecosystems. Brazil currently produces 46% of its own energy needs from renewable resources, according to Luis Cortez of UNICAMP’s presentation at the Latin American Convention of the Global Sustainable Bioenergy Project (GSB), entitled “Replacing 5% of World Gasoline Consumption with Brazilian Fuel Ethanol.” According to Cortez, it is feasible that Brazil could provide the equivalent of 5% of the world’s gasoline needs in 2025 from renewable resources in an environmentally friendly manner. Latin America has implemented a biorefinery model with increasingly integrated feedstock crop systems, co-products and large reduction of green house gases emission. There are at least two successful cases where bioenergy has proved sustainable and enabled development. These are the biodiesel production in Argentina and sugarcane ethanol in Brazil. The Brazilian case is remarkable and relevant to the GSB Project objectives: 16% of the Total Primary Energy Supply in the country comes from sugarcane and sugarcane ethanol substitutes more than 30% of the gasoline, making sugarcane the second most important energy source in the country, following oil and ahead of hydroelectricity and traditional biomass. Legislation is in place, and increasingly effective, that establishes an environmentally sound agro-ecological zoning. Latin America has land, favorable climate, diverse feedstock options and technology that has been deployed regionally and could be expanded continentally in a sustainable manner. The Biofuel industry is regarded as an opportunity for rural development and job creation. The development of new technologies may be a driver to raise public awareness on sustainability issues promoting new life styles and a dialogue between science, government and society. Government support is needed to normalize common policies, such as certification for sustainability and blends. Economical conversions technologies need to be developed that are responsive to a variety of feedstocks, scales, and other local circumstances. An agenda for research and human resource development is needed in the face of a changing social and technological reality, more specifically new technologies to improve each link in the supply chain and flexible production of complimentary co-products and broader sustainability. Reduction of commercial barriers and development of international certification standards would foster emergence of an open market, with benefits for the region and the world. The Latin American Convention of the Global Sustainable Bioenergy Project (GSB) meeting, which followed the European and the African reunions, took place between March 23rd to 25th in Sao Paulo, Brazil, at the Sao Paulo Research Foundation – FAPESP (Fundação de Amparo à Pesquisa do Estado de São Paulo). The goal of the GSB project is to create a global advisory panel for sustainable bioenergy, similar to those that exist for subjects such as climate change and biodiversity.